Azure SQL Database and Azure SQL Data Warehouse support connections from SQL Server Management Studio (SSMS) using Active Directory Universal Authentication. This article discusses the differences between the various authentication options, and also the limitations associated with using Universal Authentication. Download the latest SSMS - On the client computer, download the latest version of SSMS, from Download SQL Server Management Studio (SSMS). Azure MFA helps safeguard access to data and applications while meeting user demand for a simple sign-in process. It delivers strong authentication with a range of easy verification options (phone call, text message, smart cards with pin, or mobile app notification), allowing users to choose the method they prefer. Interactive MFA with Azure AD can result in a pop-up dialog box for validation. For a description of Multi-Factor Authentication, see Multi-Factor Authentication. For configuration steps, see Configure Azure SQL Database multi-factor authentication for SQL Server Management Studio. Beginning with SSMS version 17, users that are imported into the current Active Directory from other Azure Active Directories as guest users, can provide the Azure AD domain name, or tenant ID when they connect. Guest users include users invited from other Azure ADs, Microsoft accounts such as outlook.com, hotmail.com, live.com, or other accounts like gmail.com. This information, allows Active Directory Universal with MFA Authentication to identify the correct authenticating authority. This option is also required to support Microsoft accounts (MSA) such as outlook.com, hotmail.com, live.com, or non-MSA accounts. All these users who want to be authenticated using Universal Authentication must enter their Azure AD domain name or tenant ID. This parameter represents the current Azure AD domain name/tenant ID the Azure Server is linked with. For example, if Azure Server is associated with Azure AD domain contosotest.onmicrosoft.com where user joe@contosodev.onmicrosoft.com is hosted as an imported user from Azure AD domain contosodev.onmicrosoft.com, the domain name required to authenticate this user is contosotest.onmicrosoft.com. When the user is a native user of the Azure AD linked to Azure Server, and is not an MSA account, no domain name or tenant ID is required. 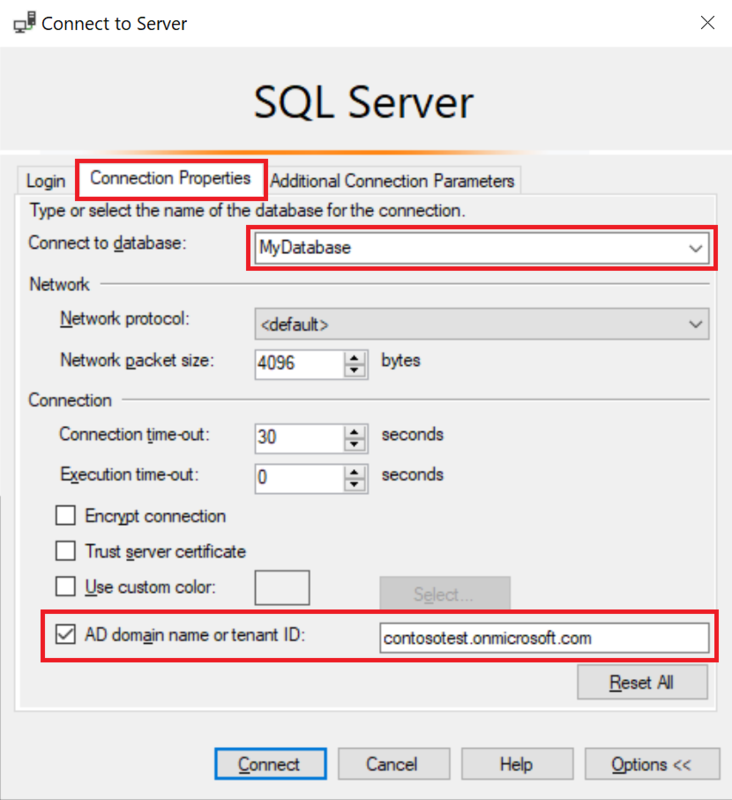 To enter the parameter (beginning with SSMS version 17.2), in the Connect to Database dialog box, complete the dialog box, selecting Active Directory - Universal with MFA authentication, click Options, complete the User name box, and then click the Connection Properties tab. Check the AD domain name or tenant ID box, and provide authenticating authority, such as the domain name (contosotest.onmicrosoft.com) or the GUID of the tenant ID. Azure AD users supported for Azure AD B2B scenarios as guest users (see What is Azure B2B collaboration) can connect to SQL Database and SQL Data Warehouse only as part of members of a group created in current Azure AD and mapped manually using the Transact-SQL CREATE USER statement in a given database. For example, if steve@gmail.com is invited to Azure AD contosotest (with the Azure Ad domain contosotest.onmicrosoft.com), an Azure AD group, such as usergroup must be created in the Azure AD that contains the steve@gmail.com member. Then, this group must be created for a specific database (that is, MyDatabase) by Azure AD SQL admin or Azure AD DBO by executing a Transact-SQL CREATE USER [usergroup] FROM EXTERNAL PROVIDER statement. 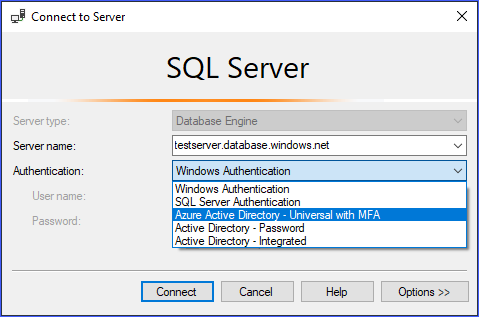 After the database user is created, then the user steve@gmail.com can log in to MyDatabase using the SSMS authentication option Active Directory – Universal with MFA support. The usergroup, by default, has only the connect permission and any further data access that will need to be granted in the normal way. Note that user steve@gmail.com as a guest user must check the box and add the AD domain name contosotest.onmicrosoft.com in the SSMS Connection Property dialog box. The AD domain name or tenant ID option is only supported for the Universal with MFA connection options, otherwise it is greyed out. SSMS and SqlPackage.exe are the only tools currently enabled for MFA through Active Directory Universal Authentication. SSMS version 17.2, supports multi-user concurrent access using Universal Authentication with MFA. Version 17.0 and 17.1, restricted a login for an instance of SSMS using Universal Authentication to a single Azure Active Directory account. To log in as another Azure AD account, you must use another instance of SSMS. (This restriction is limited to Active Directory Universal Authentication; you can log in to different servers using Active Directory Password Authentication, Active Directory Integrated Authentication, or SQL Server Authentication). SSMS supports Active Directory Universal Authentication for Object Explorer, Query Editor, and Query Store visualization. SSMS version 17.2 provides DacFx Wizard support for Export/Extract/Deploy Data database. Once a specific user is authenticated through the initial authentication dialog using Universal Authentication, the DacFx Wizard functions the same way it does for all other authentication methods. The SSMS Table Designer does not support Universal Authentication. There are no additional software requirements for Active Directory Universal Authentication except that you must use a supported version of SSMS. The Active Directory Authentication Library (ADAL) version for Universal authentication was updated to its latest ADAL.dll 3.13.9 available released version. See Active Directory Authentication Library 3.14.1. For configuration steps, see Configure Azure SQL Database multi-factor authentication for SQL Server Management Studio.